At Mirage Outdoor Services, We Design, Install & Maintain Landscape Lighting. Some of the Types of Lighting We Install are Tree Lighting, Moon Lighting, Mercury Vapor Lighting, Energy Efficient LED Lighting, MR-16, Low-Voltage, Up-Lighting & Down-Lighting for Residential Homes and Subdivision Entries. 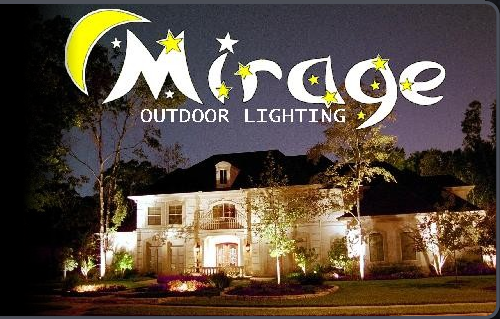 Mirage Has Been Providing The Greater Houston & Surrounding Areas With Professional Materials & Service For Quality Outdoor Lighting & Mosquito Systems Since 1997. We Service Houston, Cypress, Tomball, Spring, Sugar Land and surrounding areas. We are a State Licensed Electrical and Pest Control Contractor. We are Fully Insured and Customer Service is Our Priority! Great Installation- We start with quality parts and complete the job with professional installation techniques second to none. Great Customer Service-Before and after installation; We have maintenance programs available to insure many years of trouble free service. Great Warranties- 1-10 year part warranties, 3 year labor warranty. Great Prices- Our prices are extremely competitive with other professional installers.